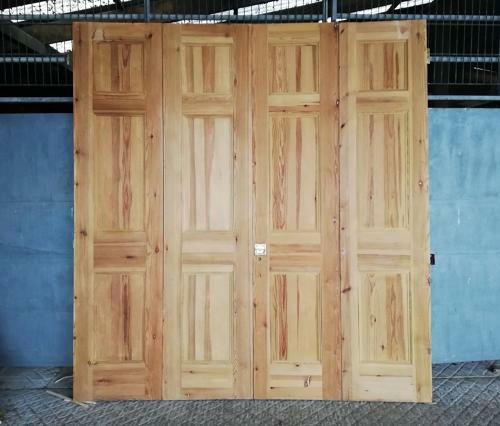 A fantastic set of Victorian style pine bifold doors. The set comprises of four solid and heavy doors, fully set up, with parliament hinges on the outer edges that allow the doors to fold flat against the wall. The outside edge of the centre doors have space for hinges to be attached to the outer doors and the doors are designed to split in the middle when folded back, with 2 doors on either side of the room. The doors were made to measure and were reclaimed from a now demolished home. The doors are very well made and are fully mortised and tenoned. There is a brass coloured handle on each side of one door and there are brass coloured latches at the base. The doors have a very attractive design, in the Victorian style, with fielded panels and a moulded edge. The doors have rebated edges where needed to allow the doors to fit squarely when extended. The pine is stripped and is ready for finishing by purchaser, with paint, a stain or wax and polish. The doors are in very good, solid condition but have some very small signs of wear as expected of reclaimed items. One door has a small gouge to the base edge. There are some marks, stains and filled wood knots. Some very small knocks and chips to the pine. One outer door is 0.5cm taller than the other 3 doors and will need slight levelling. The doors would make a stunning feature in a home, ideal for dividing a large room, and have wonderful character and quality design.